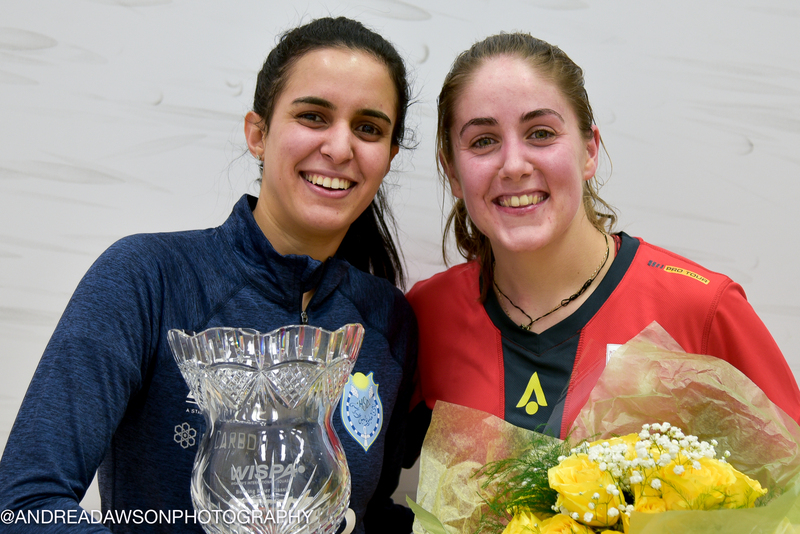 Top seed Nour El Tayeb had to play outstanding squash to overcome a phenomenal challenge from Tesni Evans in the final of the Cleveland Classic. El Tayeb mixed sumptuous squash with some incredible retrieving as Evans fought hard for every point over four games. The fourth was desperately close all the way through but at 9-9, with the crowd willing it to go to a fifth, two high-quality drop shots gave El Tayeb the win. It was her eighth PSA World Tour title and fourth in a row in the USA. Game 1: Nour seems to be in in a hurry. Looks much sharper. Tesni stays close early on but Nour pulls away to win it 11-5. Game 2: Tesni adopts a change in strategy. Helped by a friend? Attacking earlier and well , the score chugs along at 4-4, 5-5, 6-6. Genius retrieving by Nour leads to 10-6, then 11-7 game to her. Game 3: Tesni trying hard but Nour looks too good as she leads 6-1, 7-3. Tesni ups her game and wins seven points in a row to take a 10-7 lead. Great defence by Nour gets her back to 9-10. But deception in the drop by Tesni gives her the game 11-9. Game 4: High quality squash continues and the score stays tight at 3-3, 4-4, 5-5, 6-6, 7-7. Marvellous points. Finally Nour has a gap at 9-7. Good counter drop by Tesni brings her back to 8-9, and then again to make it level at 9-9! Nour works an opening and hits a drop winner to hold match ball at 10-9. Great last point as Nour wins 11-9. Match to her 3-1. PSA World Tour Bronze $51,250 Women’s Cleveland Classic 2019, Cleveland Racquet Club, Cleveland, Ohio, USA.